Aaron, I haven't given up on fixing my original door just yet. But I need to get back at soaking the pins with PB blaster again. They wouldn't budge after a couple days. I may need to actually submerge them in it for a while. I'd like to take you up on the offer of some of that brass rod if you still have? Yes, I'll cut a piece to length and send to you tomorrow. 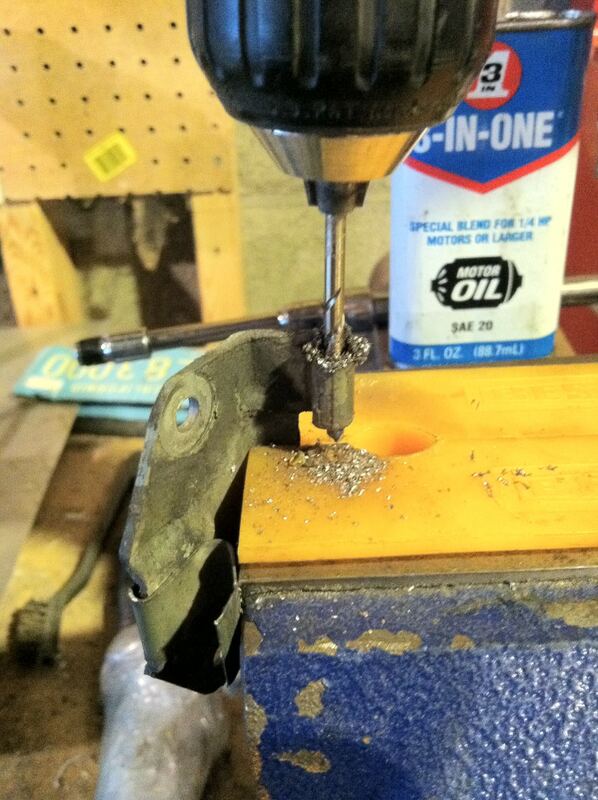 If its really stuck, Use a 1/8" bit to drill out the pin. Tried 2 drill bits before, wouldn't bite. May need to pick up new(sharp). No hurry on the rod, whenever it's convenient for you. Thanks! I used a new DeWalt 1/8" bit. The fuel door for my 99 Riviera is gone. The pin had rusted through some time ago, and while refueling on the highway I had laid it on top of the car and forgot about it, driving off, and not realizing till a good 100 miles later. Ooops! Does anyone know where to find a replacement? Or even an aftermarket type replacement? I've seen cars with chrome type fuel doors that look like aftermarket additions, but can't seem to find any that suggest they would fit the Riv. Any help in finding something suitable would be greatly appreciated. Good luck. Body parts for the Riv are far and few between anymore. Your best bet is to find one at junkyard somewhere. You can try calling the dealer and see if they can locate or get one for you. As far as I know, not one single aftermarket door is available. George is one of my fellow Buick clubmembers, and he makes a lot of junkyard runs in Florida. He has gotten me plenty of parts for my 98. I'm sure he could help you. There was a 98 Riviera some time ago that I posted a thread about. George got me and some Riv board members parts. He is a stand up guy. Give him a shot. No pro bro.....eBay's full of parts. Also try car-part.com and http://www.moradpartscompany.com - Morad's specializes in 3800 cars and they occasionally bring a Riv through and part it out. I had to replace mine a few years ago and bought one through the dealer. It was surprisingly not very expensive. The spring that pops your door open is a thin piece of steel. When it ages/corrodes it loses its springiness and either breaks or flattens. You can replace it by forming a spring out of a 5 to 10 mm piece of common spring steel flat stock. One way to get such a thing is to obtain an inexpensive screen door roller, mounted on a piece of spring steel. I used one like this: https://www.amazon.com/Prime-Line-Products-513-Tension-Bearing/dp/B0002YX4J8/. When you look at the picture, you'll see it already has a "W" bend in the spring. That's useful. Either a new or sued one of such a spring should work fine for this. I used a new one, because I don't have this sort of stuff laying around. First, using your Dremel moto-tool with a cutoff wheel, cut the spring just about 2 to 3 mm into the bend on either side of the W. Then use the cutoff tool to round off the sharp edges of that cut so you don't cut yourself working on the thing. The point is you'll turn this side into a clip that will slide onto the base of the fuel door hinge. We'll call it the "clip side." The 3 mm gives you a tab to grab with vise grip pliers. More on that later. Next, on the other side of the W cut the spring so that you leave a flat tang about 25mm long past the curve. That will form that "working end" part of the spring. Then, using a pair of vise grips, crush the clip side flat, using a metal rod such as a common round screwdriver shaft as a mandrel for that bend. The point is to form the clip side such that it will grip and hold the base of the hinge. You now need to bend the outer part of the clip outward a bit so that the functioning part of the clip is about 1 cm long only (7 mm or so is OK), and leave a little outward bend on the end. Using the Dremel cut that outward bend so that what's left sticks up about 1 mm or so only, and then use the cutoff tool to round off the sharp edges of that cut so you don't cut yourself installing the thing. Now curl the working end toward the clip side of the spring so that when it's installed the working end does not scratch up the gas door hinge but still sticks out at about a 45 degree angle. At the end you could wrap this working end of the spring in electrical tape or dip in that plastic rubber coating stuff (plastidip) --- just not yet. Now's the time to take the new spring you made to the car and check by installing it, after you remove the remnants of the old spring. You may need needlenose pliers and a screwdriver to slide the remnants of the old spring off the hinge. You also may need to bend the clip end of the new spring out a little to be able to slide it onto the hinge. Don't worry about if you bent it too much, we'll fix that next, just *don't* bend it back and forth and back and forth because if you do it will "work harden" and break. Now you need a small dish (an aluminum tart dish, a clean and empty baby food jar, an empty tunafish can, what-have-you) and a propane torch. And optionally some oil, cooking oil is fine, and for that matter used motor oil is OK (I will explain later), you just need 4 oz (half cup) or so -- just enough so when you drop teh spring into the dish or can it's covered completely. You're going to give a mild hardening and tempering to the spring. First: If you had to bend the clip end out to get it over the hinge base, now you need to crush it back into place with the vise grip pliers so that the gap in the clip is less than a millimeter. The point is you have to use the vice grip pliers and maybe the needlenoses to form the spring into final shape before tempering. Also, those of you who make springs for critical applications -- this spring is expected to work but not expected to last as long as the springs you make. Next, holding the spring with pliers, use the propane torch to heat it to red. YOu will have to move the torch around the spring. What you will notice is that once you get it good and hot it will stay red a bit. When hot through, then quench it by dropping into the oil. It will cool in a few minutes. If the oil catches fire just put a lid over the container to cut off the air. when cool, reheat the curved parts of the spring to a dull red then allow to air cool - this cooling will take a bit longer maybe 5-10 minutes. NOW you can put tape, heatshrink tubing or plastidip on the working end of the spring and install the clip end on the hinge.